Constellation attended Infosys’ 2013 Global Analyst Summit from July 29th to July 30th in Boston. Despite the below industry average growth of the previous year, conversations with key executives and top customers indicate an imminent shift. In fact, Infosys has added 100+clients not including customers from Lodestone. Retention is 98% for about 800 clients. The client list includes more than half of the Fortune 500. Repeat business is between 95 to 96%. Most clients represent the top 5 or top 10 of each major industry. All is not gloom and doom. At the Global Analyst Summit and through client conversations over the past 6 months, Constellation gained insights in how Infosys is addressing their client’s challenges. Both the Infosys executives and the clients recognize that Infosys must make significant market shift and take the lead in co-innovating and co-creating intellectual property. Infosys is in the midst of its Infosys 3.0 strategy. The firm has launched 7 new products and 7 new platforms. Consulting and integration business now comprises 34% of overall revenue. The Business and IT Operations team closed $1B in revenue last year. Total contract value booked in products and platforms is $725M as of the last quarter. Point of View (POV): Infosys has bucked the trend of decreasing average consulting revenue among the Indian IT industry. At 34% of overall revenue, this is 50% more than the average among the Indian IT industry which is 19 to 20% of overall revenues. The Infosys Edge products and platforms have gained slight customer momentum with 50% of the products used by more than 5 customers. The Infosys Finacle banking product touches 14% of the banking population in the world. Lodestone acquisition rebalances the core DNA but more change is required. Lodestone rebalanced the North American portfolio to take an EMEA focus. In addition, a bench of strategic advisory and consulting services is driving strategic deals. 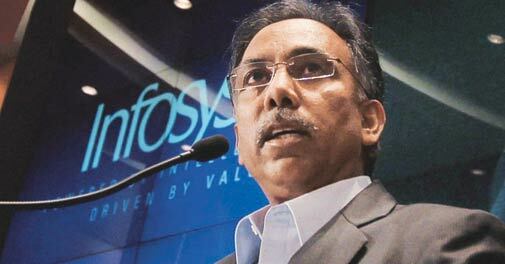 (POV): Many industry watchers believe Infosys could move faster. However, Constellation recognizes that changes to a company’s DNA requires a long term transformation. Clients have repeatedly cite Infosys’ role in bridging factions inside a client’s orgs and among competitors to broker and create new solutions. Constellation believes the pursuit of the Bharti Airtel deal from IBM will be one check point in gauging how well the overall strategy is in winning business from competitors. In any case, Infosys must move with an urgency of a burning platform. Client success stories show how Infosys is crafting strategic partnerships. Conversations with clients indicate new client partnerships where joint planning leads to joint investment of time, resources and capital. Constellation heard case studies from a global vehicle manufacturer, large travel services technology company, non-profit organization making a for profit transition, and a financial services organization. (POV): Infosys demonstrated how its partnering with clients to transform their businesses. At a global vehicle manufacturer, Infosys delivered consulting and support across 1400 apps, built a localized delivery center, and established an innovation fund. For a large travel services technology company, Infosys delivered finance and procurement BPO. At the non-profit making a transition to for profit, Infosys played a key role in helping the client make a business model shift, complete 23 acquisitions in 2 years, and building an expansion platform . In general, Constellation sees positive signs of change, but these shifts will take time. In today’s business environment, the rate of change is not only constant, but also rapidly escalating. New business models by upstarts disrupt competitors with increasing frequency in all industries and markets. In just 10 years, even 5 years, or dare say 24 months, many established companies have been left vulnerable, beaten down, and toppled by new upstarts. Over 73% of the original Fortune 500 list no longer exists, in fact they’ve been acquired, merged, or have gone bankrupt. Massive changes continue in the societal, technological, environmental, economic, and political fronts. In business models, products are now excuses to sell services. Product innovation cycles have shortened from years to months to weeks. On the work front, five generations in the workforce disagree on where to work, how to work, when to work, and why to work. Add the current trend of consumerization of IT to the pace of change and business leaders must strategically determine which new technologies should be considered. IT services buyers need a partner who can help them optimize their commodity cost structures while co-creating and co-innovating the future. The IT services firms who make this next shift, will play a role in ensuring business outcomes for their clients. This time, scale will come from IP and not additional bodies. IT Service buyers must make sure they make the right choice in partnerships or fall behind. Do you think the IT services vendors can move from time and material body shop to product and IP companies? do they have the DNA for the transition? how do you think Infy will do? Let us know your experiences. Add your comments to the blog or reach me via email: R (at) ConstellationR(dot) com or R (at) SoftwareInsider (dot) com. Research Report: Buyers Want Outcomes. Are Indian IT Services Firms Ready? Wang, R. “Best Practices: Why Every CIO Should Consider Third-Party Maintenance.” Constellation Research, Inc. August 7, 2012. Wang, R. “Market Overview: The Market For SAP Optimization Options” Constellation Research, Inc. May 11, 2011. Wang, R. “Best Practices: The Case for Two-Tier ERP Deployments” Constellation Research, Inc. February 28, 2011.